I have a friend (Elizabeth) who can rock any hair color. She's had fuchsia, hints of purple, I think even blue, in her pixie. She is one of those people who can easily pull the look off. 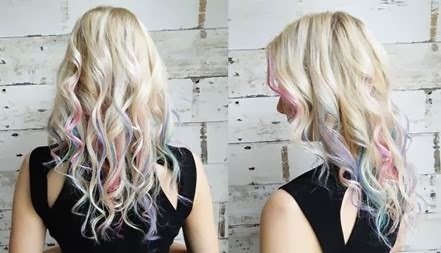 Accent colors are going mainstream this spring, as just about every colorist I have spoken with puts it on their "trend" list for spring 2014. Caitlyn Young of Salon Capri created some fantastic looks in the salon, showcasing hues such as "First Date Violet"and "Garden Party Green". The salon uses L'Oreal Professional Hair Chalk, which applies quickly, won't stain, and washes out in just 2 shampoos. 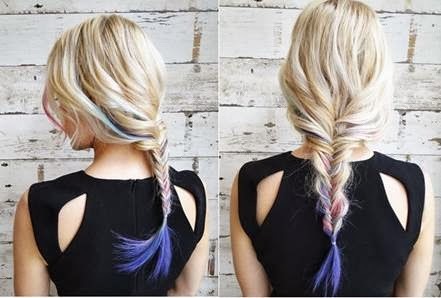 It's a great way to try a fun look without having to bleach your hair and apply a bold color over it. So I have to ask, yes or no? Would you try it?